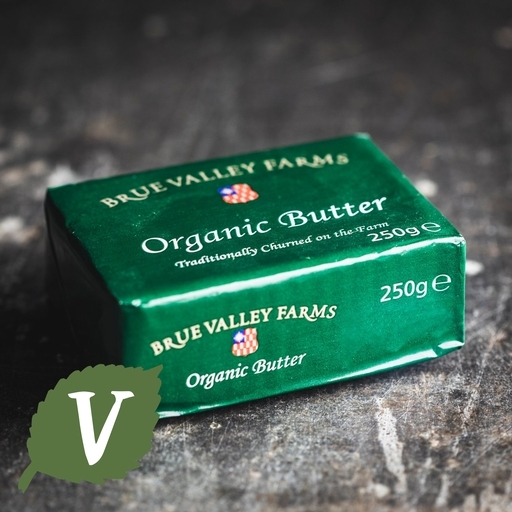 Organic butter from Brue Valley Farms in Somerset. This grass-fed butter is naturally sweet tasting, made with fresh cow’s milk cream and a pinch of sea salt. The Clapp family at Brue Valley churn their butter in individual batches, for a superbly rich quality. Keep in the fridge for up to 6 days or freeze on the day of delivery. Churned English butter (milk), sea salt* (1.5%), minimum butter fat (80%).